Recently I have seen a resurgence of Malthusian thinking. Thomas Malthus, the late 18th and early 19th century British economist, put forth An Essay on the Principle of Population, in which he argued that the world was becoming overpopulated at an unsustainable rate. Malthus’ ideas have come in and out of fashion since the early 19th century. Having heard a few people recently make Malthusian arguments, I would like to put forth a few compelling reasons to continue to disbelieve them. I will consider each in turn. Imagine a village with a single villager. This villager has to build his own shelter and find his own food and water. Imagine now, that there are two villagers, instead of one. If the villagers work cooperatively in a society, they can both increase one another’s productive efficiency. One can gather food while the other constructs shelters or gathers water, double the work can be done, and double the leisure time for the two workers results. The workers can use that leisure time to devise technological solutions that speed the rate of production and make both workers still more efficient, leading to more leisure time and more innovation. Adding more villagers increases the amount the village needs to produce, but it also further increases the productivity of the village. Overpopulation theory implicitly assumes that each added individual person consumes more resources than he produces. One way of looking at this is through an assumption the old classical economists used to make–that every person is paid precisely the value of what he contributes to the economy. This assumption is obviously not universally true–there are people who are underpaid or overpaid for the work they do. We do however know that, on balance, this assumption is true more often than it is not–if this were not the case, plenty of people even in 1st world, developed countries would be struggling to obtain food, water, and shelter, and capitalism could not function. Most people make more money than they spend, and, for people with money, obtaining food or drinking water is not difficult. The people who do struggle to obtain these essentials are the people who do not have money in the first place, and that brings us to our second consideration. Imagine a family of four that lives next door to a bachelor. The bachelor is immensely rich and buys and consumes so much food, water, energy, and shelter that dozens or even hundreds of ordinary people could survive off his income and consumption. The family next door, however, is very poor. The bachelor is happy to sell scraps from his table to the family in exchange for what the family earns, but the scraps he’s willing to give them are insufficient to feed the entire family. What should the family do? If you believe in the theory of overpopulation, the family should kill one of its members to reduce its need. This answer should strike you as obviously ridiculous, because the problem is that too much of the resources are being consumed by too few of the people in this society. Even the most fervent believer in free market economics would have to concede that, in this example, what is needed is a redistribution of wealth to the poor. Overpopulation theorists might counter, arguing that there really is not enough resources, that our example does not reflect reality. However, there is conclusive evidence to the contrary. 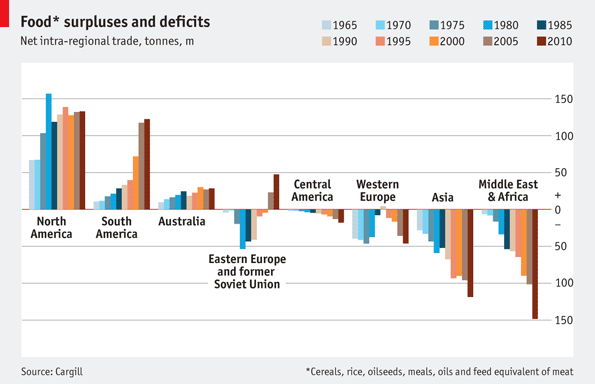 Here, we can see that the problem is really one of distribution of existing food supply–consumption more or less balances supply. Furthermore, it should be painfully obvious that poorer regions like Asia, the Middle East, and Africa, are not producing to their potential–these places do not have the infrastructure or technology in place at this time to produce food to the level that say, the North American or South American region does. Were industrialised farming brought to those regions, global food production would increase exponentially, even if no further innovations were made. The chart also shows that the size of the distribution gap has been growing since the sixties–this is the result of a rapid pace of productivity improvements via technology in the developed world that have not spread to the developing world. Here we can see that some countries consume per capita as much as 100 times the amount of fresh water that the poorest countries consume. The problem is one of providing water to the people who need it, not of absolute water supply. Distribution, again, is the culprit. It is not pleasant for free market purists, but it remains the case that the most humane way to solve resource problems is by redistribution, not by draconian efforts at population control. Supporters of overpopulation theory may well contend that this is all fine and good for now, but what about in the future, when we really do run out of room? What about all those websites we visited in science class in school, that told us that, “if everyone lived like you, we’d need X number of earths?” This brings us to the last point. Consider this–the population of the United States has doubled since 1950, while agricultural output has nearly tripled, while the amount of money paid to labourers is over 75% less than it was then. US agriculture continues to produce more food at a faster rate than population growth needing far fewer people to do it. When Thomas Malthus first made his argument, the population of the world was about 1 billion. Today the population exceeds 7 billion. Every time advocates of the overpopulation argument return, technology advances are made. What are the new advances that will increase the carrying capacity of the planet going forward? Those websites you might have been to that say “we’d need X many earths if everyone lived like you” assume that everyone consumes like a 1st world country, but they forget that 1st world countries are not merely world-beating consumers, they are world-beating producers. As the third world develops, it will produce exponentially more than it does today. There remain distribution problems, and places with food and water surpluses need to send those resources to places with deficits. There remain environmental challenges, as our development needs to be sustainable and minimise the threat of climate change and environmental catastrophes. These challenges can be surmounted without programmes of mass sterilisation or extermination. If you still find yourself wanting to believe overpopulation theory, consider what has happened in countries whose populations have declined. Places like Japan, Germany, and Russia find themselves without sufficient young, productive workers to pay for the benefits of retirees, making it difficult to sustain social programmes. Even countries conventionally thought of as overpopulated like China are impacted. There is a wide and rich literature on this subject, often referred to as “demographic crisis”. This sentence contains links to several interesting pieces on the subject. Nice to have an area on which we are in almost full agreement, Ben. Glad (but not surprised) to see you’re not buying in to the overpopulation hype! Thanks Mr. Mathew! It is a bit of a zombie idea–it just keeps coming back into fashion every few decades. I think this is a somewhat simplistic view. Overpopulation does create multiple problems for the environment and social well being of the individuals. Look at the unemployment rates of the world (especially in the 18-25 age group) and the downward spiral of the 1st tier populations: eroding wages increased cost of staples and energy and the real sustainability of agriculture. To adequately address these and other issues will require a stable population with defined goals to achieve a balanced sustainable and rewarding; economic, environmental and socially positive world. We are on a tightrope and everyone needs to move with precision and communications to get to the other side. The rope only supports so much weight and one member jumping at a critical juncture can cause most if not all to fall. Interesting view, but I would argue that higher long-term unemployment is the result of automation and increases in productivity more than it is the result of more people. We can see that this is so because our economic supply is meeting demand despite an increasing population with higher rates of unemployment. With more people consuming but fewer people producing while demand is still met, it is evidence that the population is more easily, not less easily sustainable. It’s true that some productive work needs to be found for those people who are unemployed due to productivity increases, but that has always been true throughout history–when humanity developed agriculture, the food demands of the communities could be met without everyone participating in food collection, and so new jobs were found for the unemployed, leading to metallurgy, science, and all of those wonderful things. The same thing can happen going forward, with excess population employed in the arts and sciences. I agree that the environmental concern is a serious one, but would argue that efforts to eliminate population growth give us demographic problems that strain the welfare state. Surely a better solution is one of using sustainable technologies to reduce and in time eliminate the environmental impacts of productive output? Cleaning up our method of producing electricity would give us a source of renewable carbon neutral energy, suitable for accommodating excess population. The employment of these kinds of technologies is also job-creating and economy-boosting.